It's not that RocketTheme always come up with something new, just usually and this month is no different. This month is, I think they've created one of the boldest themes possible and it's only bold it you want it to be. 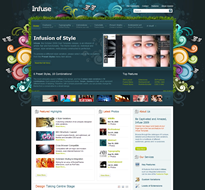 The theme comes with six styling options but each style has three levels, so this means, if you are going to use one of the pre-installed styles, that you can control the level of your site boldness, or, if you start thinking a little outside the box (okay flirting on the edges), there are loads of possibilities with having easy access to control the background to your site. But I challenge anyone to use every module position on the homepage - there are just too many, I don't think it possible. This isn't a negative thing, it's a hugely positive thing, as all module positions are collapsible - if you don't use them they don't show up and it means you can pretty much have the homepage look however you want it. The theme is search engine optimised, there is new typography not seen before at RocketTheme and the ever popular Fusion menu, something I think I might have to start playing with soon. Add to that all the extensions you get from RT, then it really is a no-brainer. Click here for a demo, more information or to sign up to RocketTheme.